Hindsight, as they say, is 20/20…If I had known what I know now, in terms of skills and tools, I would have had a lot more to offer my at-risk students when I was a Special Education Teacher. Children living in poverty have extreme behaviours, at times, because they are living in extreme circumstances. It is completely understandable for hungry children to be restless and hyperactive. This can also happen when they are exhausted from not sleeping. There are some very grounded and practical reasons why I joined forces with Kate Bartram-Brown to bring Mini Me Yoga to Canada. I am a Mini Me Yoga Ambassador. I want all children-regardless of background and income, to feel Joy and Safety at school and at home. I train parents and educators both, on our core 15 minute program, because it’s important. I teach Teachers how to use Mini Me as a classroom management tool. There are very gentle ways to manage kids, especially little ones, that are fun and not stressful. If I had Mini Me when I was teaching, even with Middle School kids, I absolutely would have made use of it! Mini Me is modified Yoga. The poses are modified to be appropriate for growing bodies without stressing muscles or joints. There are games that absolutely are appropriate for a classroom setting, and can be used whenever there’s a last-minute schedule change or even at the end of a class period or the end of the school day. This is constructive fun. 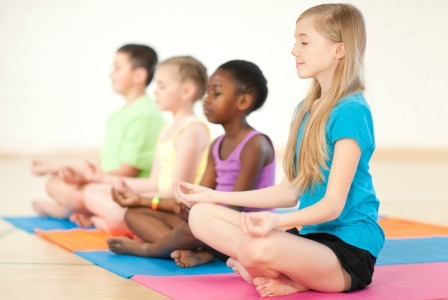 From a health perspective, Mini Me Yoga teaches healthy breathing and heart-centeredness. The other important tool I offer is meditation. For all of you old school educators, you’re going to have to believe me, the kids are ready to learn and it helps so much in terms of classroom atmosphere. You may think this is totally crazy, but there is plenty of research out there about how meditation and yoga help kids. I have ADHD and trust me, I have used the Max Meditation System TM, among other tools, to manage it successfully and to get off medication completely. It is not only possible, it’s necessary. I have plenty of derivative tools I teach educators and parents. I teach the actual Max Meditation TM class in weekly in Oakville Ontario. As parents and educators, it’s so important to stay relevant and also to seek out the most gentle and clear methods of classroom management. I have co-taught Mini Me Yoga to children with autism. Every child can learn and benefit. I taught mostly children with behaviour issues for 7 1/2 years. Alternative methods that are grounded and practical transform classroom settings, whether or not the children have learning or behaviour issues. Temple Grandin, if you don’t know already is a full-blown Autistic who has been a trailblazer in so many ways: women’s rights, Autism Advocacy, Humane treatment of animals. If you have not had a chance to see her life story on HBO, it is a real mind-blower! the visual description of how her mind works is such a gift! I am visual and auditory and also an adult living successfully with ADHD, Depression and probably a touch of Aspergers. Temple has done so much good, truly by her willingness to simply not settle for being less that all that she is! She has helped millions of people understand what Autism is and how it has nothing whatever to do with intelligence or a lack thereof. She suffered much in the 60’s and 70’s as a woman who was not taken seriously, because of Autism, and also because she is a woman. She did not give up and was successful in creating transformative changes to the treatment of cattle and livestock in processing plants-making their final journey so much more humane than ever before. I, for one, am so grateful for Temple’s work and am very excited that she will be a guest on Neurodiversity Radio when we can schedule the time! Light and Love to you! © Neurodiveresity Coaching TM 2012. All rights reserved. Dr. Stephen Hawking is a perfect example of Neurodiversity in action! Who is to say that his physical being is a deformity? Is it not entirely possible-ye probable-that he is exactly who he needs to be both physically and mentally? Would he be the Genius that he is if her were “cured”? Why would we need to assume he needs a cure? When you look at someone in a wheelchair, what do you see? Do you see a what or a who? Isn’t it time we saw all whos and got rid of whats? When you can fully embrace the who of you, can you then embrace the who of others and finally let go of the what?